"The world's best dressed teen-age fashion doll!" Tiny Teens certainly fit that description. They look like Dolly Darlings in a Liddle Kiddle locket. box boasts that you can even wash and set their hair! Mod carded fashion accessory sets were also available for the girls. 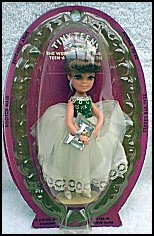 Uneeda re-used the name Tiny Teens in 1974, for a line of eight-inch dolls. They also did this with the Petal People series.